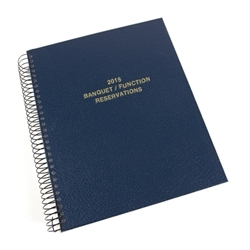 Our high quality custom banquet/function reservation book is the ultimate business tool. Designed specifically for you, it comes in any size and cover color with your desired information inside. Elegant yet durable, it features a leather-like, gold stamped hard-cover with metal spiral binding. This book can be further personalized by adding a stamp of your logo to the front cover.